You may think that spending a few quid in a car wash every week will keep your motor looking like new, but even opting for the most expensive wax treatments won't remove all the nasties attacking your paintwork. We've all seen red cars with faded paintwork where the sun has caused the pigments to degrade to an unsightly pink, but this same degradation happens to all cars to some extent. Sunlight, rain, bugs, brake dust, tree sap all these harm the paint finish, making it vulnerable to lasting damage. Paint correction is a method of removing these imperfections which effectively removes the top layer of damaged finish, replacing it with protective waxes. This protects your paintwork from further attack, and leaves your car sparkling like new. 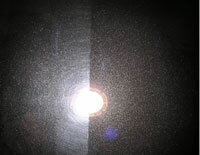 One of the most noticeable consequences of paint correction is the removal of swirl marks. 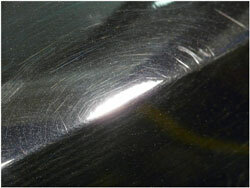 These look like very fine scratches which are caused by car washing even using a sponge can cause paint damage! Paint correction can also rejuvenate faded or dull paint work, as it removes the damaged later allowing it to shine in all its glory. There are many garages who will offer paint correction services, but there are some super products out there which let you do it yourself for a fraction of the price. Unless your car paintwork has some serious problems, such as orange peel or deep scratches then we would recommend using a polishing compound followed by a wax or sealant to protect the new paint surface. 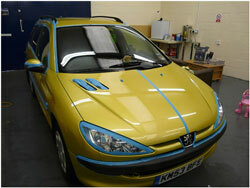 Masking tape to protect the trim and any plastic/rubber from being discoloured by the polishing process. Firstly, you need to mask off any badges, trims and plastics so that they don't become discoloured by the compounds. Next, make sure you are in a good light, and can see clearly the swirls and imperfections you want to remove. If you are outdoors, remember that sunshine isn't always reliable, so have a good spotlight on hand in case it clouds over. If you are planning on polishing by hand then you can expect a high gloss finish, but for swirl marks and more challenging surfaces we would recommend using a polishing machine. Take a micro fibre cloth, and fold so that you can hold it comfortably and apply an even pressure. Add a small amount of polish the size of a 5p coin and work on a small section at a time (not bigger than a metre square). Use a circular motion to spread the compound over the area, then use up and down, left and right, and diagonal motions to work the product in. Keep working the area until the polish appears clear. The compound will go from looking wet on application, to looking hazy or translucent as it works with the damaged surface, through to appearing to have dried or left a clear oily residue. Make sure that the compound has reached the final stage before wiping off the residue and examining the result. Repeat as necessary, altering the pressure or speed to achieve the desired result. Firstly you need to choose your polisher. Orbital polishers are easier to use, and effectively foolproof. They polish with an eccentric circular motion, similar to hand polishing except much faster. As the movements are irregular there is less risk of building up heat and burning or damaging the paintwork. Rotary polishers spin direct from the motor, and can build up heat. It can be used for the job, but care has to be taken not to damage the paint surface further. Remember to keep them moving so you don't cook the paint! As with hand polishing, work on a small area at a time. If using a machine it is best to use a less obvious area first so you can try our different pads and speeds until you are happy with the result. The time it takes to work in the polish, and the amount of pressure needed will vary depending on the type of product used, the temperature, and the speed you work at. It is best to work initially by trial and error, always starting with the lightest polish working towards more aggressive polishes, and finishing with a lighter polish or pad, thus refining your work.